Sweet and Smart Montessori preschool and kindergarten is committed to helping you lay the foundation for a healthy and successful child along with helping you develop a “whole person” both socially and intellectually fulfilled being. Toddlers: We are keenly aware of the benefits derived from early establishment of social behavior: sharing and leadership are among the early traits developed. Our Toddler program slots 1 to 3 year olds. Early Childhood: At this level we are helping to solidify the gains of our early programs or helping newcomers to prepare for the extraordinary journey of life. Our curriculum is based on the teachings and examples of Maria Montessori. There are many facets to the Montessori view of education. Some highlights of this philosophy include the growth of a child toward greater independence, responsibility in a group, a mature sense of justice and fairness, understanding the global perspective in terms of a peaceful earth, self-discipline, enjoyment of leadership, and learning to problem-solve. It includes a prepared environment, which allows the child to experience daily from the following areas: Practical Life, Sensorial, Math, Language, and Cultural Subjects (Foreign Cultures, Languages, Music and Art). Our goal is to accompany your child in his quest toward in experiencing excellence and good social interaction. The Toddler Room welcomes children between 12 months to 3 years old. This is what we call the pre-Montessori. In this room the child is first exposed to the principles of the Montessori Philosophy. The Toddler Room environment is specially designed for the children to explore the world using their hands. There will be preliminary coordination exercises, simple sensorial materials, pre-reading and vocabulary enrichment materials present. Also included is a program of activities to introduce the child to science, math and social studies. As the children grow and learn, additional classroom materials will be introduced accordingly. In Early Childhood Room, we have kids between 3 years and 6 years old In this stage the child will get introduced to different structural materials and will discover by himself that he is challenged and motivated to learn new concepts. For example, the best age for learning to write is from three and a half to four and a half. The sandpaper letters will be introduced at this time while the child is most interested in the shape of letters. The introduction of math to a young child begins with his drive toward order and exactness at around age two. At around three he will begin to recognize numerals and to work with counting exercises. By six, most Montessori children are very comfortable with addition, subtraction, multiplication and division of four digit numbers, the decimal system and fractions. Repetition is a vital part of the Montessori philosophy of education. Since the work of learning is internal, only a child himself knows how many times he needs to repeat any given exercise to make it part of him. Learning good manners and social graces are also most beneficial to a child of two and a half to six years and are introduced in a Montessori way through lessons in grace and courtesy. The Montessori Method was developed by Maria Montessori in the early 20th century. Maria Montessori was a physician who was dedicated to the care of young children. Through careful and deliberate observation, Dr. Montessori began to understand the unique construction of the young mind. Through her experience in psychology and education she developed a dynamic method of directing young children. The Montessori pedagogy was developed through careful construction of the prepared environment. Children are introduced to an environment specifically suited to their developmental needs and provided the freedom to explore it in the manner most natural to them. This is referred to as “the child’s true and normal nature.” In this environment the teacher allows the child to direct and utilize their natural intuitions and exploration. Practical Life Children use materials to stimulate and develop coordination and the ability to conduct daily living activates such as buttoning, lacing, scooping, pouring, and categorizing. Sensorial Children use materials to develop multiple senses. In conjunction with specialized tools, they begin to understand and master concepts related to sequence, volume, and dimension. Mathematics Children learn addition, subtraction, division, multiplication, numeration, and place value. These materials vary in construction. All the materials are created to allow the use of multiple senses. Language Children master the alphabet and the sounds associated with each letter. 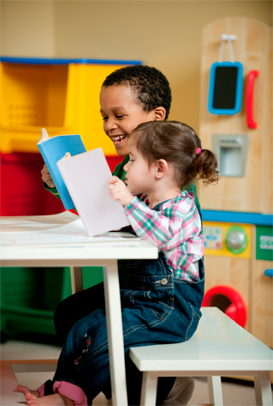 Children also develop phonetic skills such as vowel, consonant, and cluster sounds. In addition, children learn to master their fine motor skills and coordination, culminating in the use of a pencil to create written language. Culture This curriculum component has numerous areas. Science, History, Geography, and Foreign Language are all incorporated in cultural lessons. At our school, each subject is taught in a careful, step-by-step manner that ensures the child will advance with full understanding of the application of the elements in their environment. Students are taught to make connections within and between subjects–and also between school and life. Our teachers motivate the students, by showing them the importance of the knowledge they are working to acquire. Every child is challenged to achieve, and is allowed to progress at his own pace. The proper content taught by the right method engenders real enthusiasm for learning.